Darren Jamison, President & CEO of Capstone Turbine joins BNN to explain how microturbines produce clean and green power. 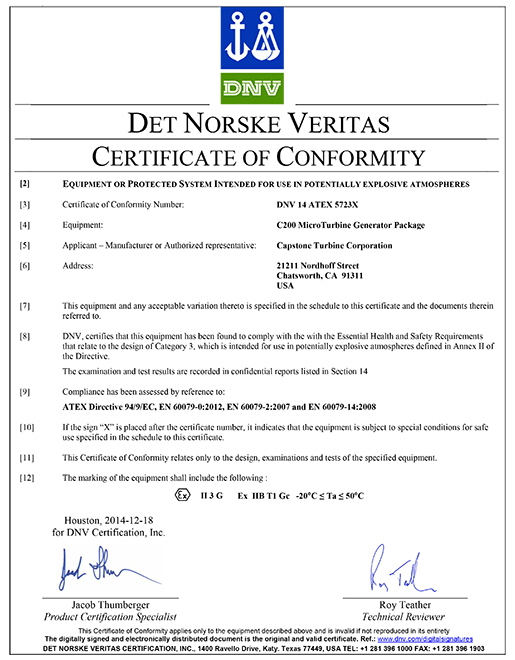 Capstone received the Certificate of Conformity from Det Norske Veritas (DNV) for its C200 microturbine with ATEX product directive 94/9/EC. Regatta Solutions and CleanWorld partnered to introduce the first Renewable Energy Anaerobic Digester (READ) which was unveiled on the campus of UC Davis just in time for Earth Day 2014. The digester uses bacteria to convert waste to methane, which is then converted to electricity via a Capstone C800 microturbine. The facility, comprised of four large tanks, sits on a single-acre closed landfill on the UC Davis campus and has the capacity to process 50 tons of waste per day. The waste needed for the digester is gathered from the campus and other local retailers. Steve Acevedo, president of Regatta Solutions, noted, "We celebrate the ingenuity of this project that was conceived within a great California institution and brought to the commercial market with a pioneering company like CleanWorld. We are proud to have assisted with the application engineering and commissioning of the Capstone C800 microturbine that are a part of the Organic Rankin Cycle assisting in the waste heat conversion." Cleanworld and UC Davis plan to take this technology to other campuses and facilities across the country and globe. The demonstrated success of the Capstone microturbine plays a crucial role in the widespread adoption of this process. With greenhouse gas emission and fuel sources topping the policy dialogue, this solution has the potential to have a broad impact. Capstone Turbine President & CEO Darren Jamison interviewed by Varney & Company on Fox Business about the partnership with Wal-Mart and the Walmart Vehicle Experience (WAVE) concept truck. Capstone Receives EPA Combined Heat and Power (CHP) Partnership Certificate recognizing Capstone’s 2013 avoided greenhouse gas emissions. In 2013, Capstone avoided emissions of more than 298,000 metric tons, equal to those from the generation of electricity used annually by 40,955 homes. 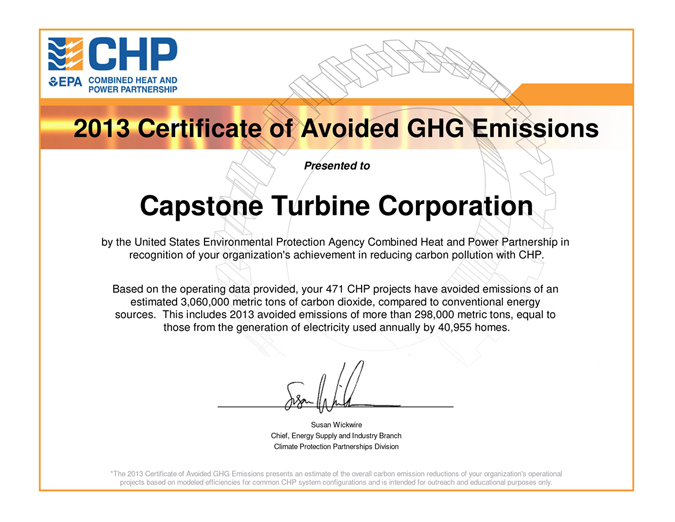 EPA Combined Heat and Power (CHP) Partnership recognizes Capstone's 2012 avoided greenhouse gas emissions. In 2012, Capstone's reported CHP projects avoided emissions of more than 316,000 metric tons – equal to the estimated generation of electricity used annually by 39,342 homes. The total avoided emissions for all reported Capstone Turbine Corporation CHP projects is estimated at more than 3 million metric tons of carbon dioxide, compared to conventional energy sources. Representatives from the South Coast AQMD and Southern California Edison today will dedicate 23 propane-fueled electrical generating units at the Edison power station near Avalon to help reduce air pollution and cut diesel fuel use on Catalina Island. "These microturbines are helping to reduce smog-forming pollutants and diesel particulates from Catalina's power plant," said William A. Burke, Ed.D., AQMD's Chairman. "This will help improve air quality not only on Catalina but also on the mainland as prevailing winds can carry pollutants onshore." The addition of the microturbines to Southern California Edison's electric system on Catalina Island provides approximately 1.5 megawatts in capacity,while reducing the consumption of diesel fuel by 200,000 gallons annually, said Caroline Choi, Southern California Edison's vice president for regulatory policy. "We are pleased to celebrate the dedication of 23 microturbines," Choi said. "The microturbines allow SCE to operate its diesel engines in an optimal manner for the installed emissions reduction equipment." AQMD provided the 60-kilowatt microturbines to Edison and they became operational at SCE's Pebbly Beach generating station in December 2011. Prior to that time, diesel engines provided 100 percent of electricity generated on Catalina. In 2012, use of the microturbines reduced diesel fuel consumption at the power plant by 200,000 gallons, or about 10 percent. This in turn reduced smog-forming nitrogen oxide emissions from the facility by about 8 percent and diesel particulate matter by about 9.5 percent. In addition to reducing air pollution and diesel fuel usage, the microturbines supplement electrical power and help offset peak power loads on the island.Last year, the microturbines generated 2.5 million kilowatt-hours of energy or about nine percent of the total power produced on the island. Since 2001, AQMD has deployed 210 similar microturbines throughout the Southland. Microturbines, fueled by natural gas or propane as well as renewable biogas from landfills and wastewater facilities, can provide clean, alternative power to distributed generation projects that are not connected to the power grid. Berlin, 20th June 2012 - Greenvironment Plc (WKN: A1JLT1 / Symbol: GIV1) has recently received an order from BRUNO BOCK Chemische Fabrik GmbH & Co KG, Marschacht (Germany), to supply a 2x200 kW microturbine power plant. The delivery of the components will take place in September 2012. Commissioning is planned in October 2012. BRUNO BOCK Chemische Fabrik GmbH & Co. KG, founded in 1937 in Hamburg, specialises in manufacturing of organic sulfur chemicals. BRUNO BOCK (www.brunobock.de) is a leading producer of thioglycolic acid. Besides thioglycolic acid and its derivatives, at the manufacturing site in Marschacht - 30 km east of Hamburg - 3-mercaptopropionic acid, thiolactic acid and their derivatives like polythiols and salts are also being produced. The main applications of these chemicals are in stabilizers for plastics, in the cosmetic sector (perms, hair removal), in the field of polymer chemistry (paint, acrylic, epoxy resins) and in the use of rubber (e.g. cold flex agent). BRUNO BOCK realizes about 30 percent of its sales in the U.S. together with its subsidiary EVANS CHEMETICS, 40 percent in North and South America and 25 percent in Asia (of which 10 percent in China). For this project Greenvironment, in cooperation with the renowned SAACKE GmbH, a world leader in combustion technology, delivers a low-emission and highly efficient solution for steam production. It consists of two 200 kW microturbines as well as adapted control technology (including visualization and SCADA) in cabinets. The system components are accurately matched to fit, thus ensuring a perfect synergy. Capstone microturbines used by Greenvironment convert about 33 percent of the supplied fuel energy into electricity. The remaining 67 percent is available in the form of thermal energy in the exhaust stream at a temperature of around 280 degrees Celsius and with an oxygen content of about 18 percent. The heat or thermal energy generated in the process is directly fed to a SAACKE gas combustion unit as hot exhaust gas. The oxygen content of the turbine exhaust gas is efficiently used in order to maximize the overall efficiency of the plant. The thermal energy generated in the microturbine CHP plant is optimally used by the adoption of an additional firing. Dr. Detlef Schmidt, Managing Director of BRUNO BOCK Chemische Fabrik GmbH & Co. KG, said: "We are producing sulfur compounds that are used in many everyday products. The product range where sulfur compounds from the Elbmarsch are used ranges from cosmetics to plastics, heat stabilizers, coatings and adhesives. In the production process, we need a lot of heat. The highly efficient CHP solution from Greenvironment/SAACKE has perfectly met our requirements." Mr. Jost Sternberg, Technical Director of SAACKE GmbH, adds: "The cooperation with Greenvironment is already yielding fruit and I am convinced that BRUNO BOCK chose the best solution for the generation of process heat that is currently available on the market. In combination with waste heat recovery and additional firing, a microturbine delivers an almost twice as high overall performance compared to conventional systems with gas engine - in other words, thanks to this combination the customer only needs half as much primary energy. This saves money and pays off in hard cash in the medium term." Mr. Matti Malkamäki, CEO of Greenvironment Plc, said: "We are delighted that we already received the first customer order so soon after the Hanover-Fair, where we presented this trendsetting steam solution in cooperation with SAACKE. In addition, we also have a large number of inquiries regarding this innovative solution on hand." Founded in 1931, SAACKE GmbH develops, produces and distributes combustion plants, waste treatment plants and energy installations. More than 1,000 people worldwide are working for the owner-managed group of companies with headquarters in Bremen. The SAACKE product portfolio comprises of industrial burners and combustion systems, appropriate control software and internet-based software solutions for the maintenance of these facilities. Based on standard products and specific customer requirements, SAACKE is projecting and manufacturing customized combustion plants. The application range of SAACKE plants is manifold - both in terms of energy sources used as well as in terms of applications: in addition to utilities, waste incinerators, industrial heating plants, especially companies in the chemical industry, steel production or food production are relying on SAACKE technology for heat or steam generation, but also for the thermal disposal of waste materials. SAACKE is present in over 50 countries with their own businesses, service stations and through partner companies. More than 100,000 industrial combustion plants and over 6,000 ship boilers in use worldwide. More information can be found at www.saacke.com. Greenvironment is a European company active in the decentralized energy generation market which plans, builds and operates CHP heat and power plants (CHP). The company offers CHP plants in a power range of 50 kWel to 4 MWel and is a market leader in the use of innovative microturbine technology in electricity generation from biogas and natural gas. Greenvironment is an important distribution and technology partner of Capstone Turbine Corp. (Nasdaq: CPST), the world-market leader in the production of microturbines. Microturbines benefit from high availability, low maintenance requirements, low emissions and flexible heat utilization. All Greenvironment CHP plants are operated by a highly efficient centralized process management system at the operations centre in Berlin. See also the CEO Blog in the investor relations sections of our website www.greenvironment.com. This publication serves information purposes only and constitutes neither an offer to sell nor a solicitation to buy any securities of Greenvironment Plc. This press release contains forward-looking statements based on the beliefs of Greenvironment management. When used in this press release, words such as "anticipate", "believe", "estimate", "expect", "intend", "plan" and "project" are intended to identify forward-looking statements. Such statements reflect the views of Greenvironment as of the date made with respect to future events and are subject to risks and uncertainties. Many factors could cause actual results to be materially different from those projected here, including, among others, changes in general economic and business conditions, changes in currency exchange rates and interest rates, introduction of competing products, lack of acceptance of new products or services and changes in business strategy. Greenvironment disclaims any intention or obligation to update these forward-looking statements. World Environmental Solutions (WES) has received the first purchase order to supply a MultiGen QUAD generation system for a NSW Government Education Institution in the Riverina district. The system will produce water from the air, reverse cycle air conditioning and electricity, and is powered by natural gas. The colleges have a government mandate to reduce carbon emissions by 20% before 2014 which the MultiGen does. The MultiGen product is a clever solution that combines a number of highly reliable, efficient, low emission, commercially proven technologies with it’s own propriety water making technology. The new MultiGen 65g 90kWr system will provide a cooling capacity of 90kWr (26RT) to replace the facility’s highly inefficient and obsolete air conditioning equipment. MultiGen’s water-making and air handling components will provide winter heating and summer cooling for the campus library and associated training rooms. The water made from the air, approximately 450,000 litres per year (118,877 US Gallons) on the fringes of the Outback, will be used to irrigate nearby gardens and a lawn area. The natural gas fired micro turbine component will generate 65 kW of electricity per hour (569,000 kW per year) some of which will be used to power the electric chiller while the micro turbine's waste exhaust heat will be used to power 2 adsorption chillers running another AC/ Water maker.. These air cooled Absorbtion chillers can also be fired by natural gas. Excess electricity generated by MultiGen will be used at the site for other purposes. This reduces the facility’s grid requirement and reduces the carbon footprint. The system can also operate as a back-up power supply in the event of an electricity grid failure. The MultiGen system will save an estimated 300 tonnes of CO2 per year and is to be connected to the organization's existing building management system that will monitor the system’s performance, the gas required as well as the electricity and water produced. The required capital expenditure has been predicted to be paid back within 5 years. Grid supplied electricity charges in Australia have increased by over 40% in the last 3 years prices and are expected to increase by a further 60% over the next 2 years. This is due to the cost of new grid infrastructure and the introduction of the Australian Government’s Carbon tax from the 1st of July 2012. MultiGen uses natural gas in its process and thus saves carbon emmisions. Gas prices have increased by only 3.5% last year and are expected to hold steady with predicted annual increases of between 3 and 3.5%. In Australia this situation is seen as a key market driver for many organisations now actively seeking solutions like the MultiGen. Make water from the air. "During the last 6 months we have worked together with our technical partners and the College FACULTY to design a MultiGen solution that meets their requirements. Plans are already well advanced for the addition of another MultiGen system at the same facility while one other is to be sent to tender shortly and installed at another regional campus. We expect to receive additional orders within the next several months from similar campus's. This project and the other 14 regional colleges is set to act as a prime example of energy efficient technology, and also function as an educational aid to HAVAC students certification. The MultiGen technology will eventually be used as part of the HVAC engineering curriculum within the NSW Government’s education program and is expected to be taken on state wide. WES will be working with the campus in developing a MultiGen learning module to be integrated into the courses offered to students at the campuses where MultiGen systems will be installed". said Walter Ivison CEO at WES. MultiGen is a unique integrated and flexible solution that includes water-maker / air handling units, air-cooled electric and / or absorption chillers, natural gas powered micro turbine turbine, heat exchanger, together with a gas compressor, chiller pumps, waste heat exhaust ducting and computer controls. MultiGen can be scaled to produce 1000's of liters' of water from the air per hour, megawatts of electricity and enough cooling and heating capacity for a large shopping centre or manufacturing facility. For more information contact www.multigen.com.au. Capstone recently released an interactive Sales & Marketing app called CapstoneWorld™. This interactive landscape features Capstone applications across all of our market segments. The app allows users to learn about Capstone, explore our product line, view our corporate promo and airflow animation videos, and drill down to view written as well as video case studies for each of our market segments. Version 1.0 of CapstoneWorld™ may be accessed by visiting http://www.capstoneturbine.com/world/. As part of the Obama Administration's efforts to help consumers save money by saving energy, the Department of Energy's first-everApps for Energy competition began on April 5th. Apps for Energy challenges innovative software developers to build new apps – for mobile phones, computers, tablets, software programs and more – that utilize Green Button <http://collaborate.nist.gov/twiki-sggrid/bin/view/SmartGrid/GreenButtonInitiative> data from major utility companies to help consumers and businesses use less energy and save money. Capstone developed a Distributed Energy Calculator (DEC) which was submitted for the Apps for Energy competition. The DEC is a customer-centric app that offers educational information about the environmental and economic benefits of using Capstone microturbines alone or together with solar panels and/or small wind solutions. Capstone's DEC app uses the required Green Button data as well as data from Capstone's Economic and Sustainability Calculators. You may view Capstone's DEC by visiting http://distributedenergycalculator.com/. Public voting for the best new app starts on May 17th and ends on May 31st. Information about the competition may be found by visiting http://appsforenergy.challenge.gov/. Please be sure to submit your vote for Capstone's app by the May 31st deadline. To vote, please visit http://appsforenergy.challenge.gov/submissions/7995-distributed-energy-calculator and click on the red "Vote" button.You'll need to sign up for a ChallengePost account or login with your Facebook account in order to vote, and you may vote daily. Capstone is currently working on an app that will merge both CapstoneWorld™ and the Distributed Energy Calculator into one. In addition to making the interactive app more customer-centric, version 2.0 of the app will have expanded animation videos, case studies, and product information. Additional functionality will be built into this version allowing users to share parts of the app with others. Finally, the app will be coded to play on iPad, Android and web browsers.